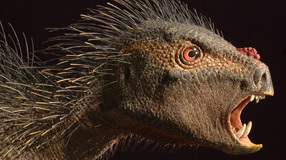 Paleontologist Paul Sereno identifies a dwarf species of fanged plant-eating dinosaurs from southern Africa. The Logan Center for the Arts makes its official debut this week, but the facility is already the collaborative "mixing bowl" its visionaries intended. A UChicago surgeon specializing in cochlear implantation harnesses "the power of words to unlock a child's potential." New Girl Scout chief of staff Nhadine Leung, AB'90, bleeds green. Chicago Booth returning to the top of the Economist's MBA rankings "is proof that it is a well-rounded school." To celebrate his 75th birthday, composer Philip Glass, AB'56, asked Beck to find artists to reimagine his music. The revitalization effort on 53rd Street is the University's answer to the question, "How can we be a part of the city that we're named for?" Argonne physicist Salman Habib discusses how computer simulations will affect cosmology. Former Chicago mayor Richard M. Daley and his Harris School students will work with Gary, Indiana, leaders to address public-policy challenges. After 13 years in public radio, Steve Edwards discusses his move to the University's new Institute of Politics. College students no longer have to pass a swim test or take physical education classes to graduate. Did you take the swim test in a string bikini or Victorian bathing suit? Did you satisfy your PE requirement by taking ballroom dancing or archery? E-mail PE memories to uchicago-magazine@uchicago.edu by November 1 with the subject line "Go Ask Alumni."